Forefront Identity Manager (FIM) Sync « Jorge's Quest For Knowledge! When upgrading FIM or MIM to a newer version, you may need to uninstall the previous version first before installing the newer version. During the installation of the new version you need to reenter all the required information. But where do you get that data from? Either you have some installation/configuration guide or you make sure you make a copy (copy, export, backup) of the previous configuration so that you can look it up easily. Making a copy of the previous configuration manually can take quite some time to finish and if unlucky you might even forget something! Yes, you guessed it, PowerShell to the rescue! With the upcoming SP1 for MIM 2016 you may need this script. I wrote this script, therefore I own it. Anyone asking money for it, should NOT be doing that and is basically ripping you off! The script is freeware, you are free to use it and distribute it, but always refer to this website (https://jorgequestforknowledge.wordpress.com/) as the location where you got it. I do not warrant this script to be fit for any purpose, use or environment! I have tried to check everything that needed to be checked, but I do not guarantee the script does not have bugs! I do not guarantee the script will not damage or destroy your system(s), environment or whatever! If you do not accept these terms do not use the script in any way and delete it immediately! REMARK: the installation of a newer version against an existing database WILL upgrade the database. Make sure to have a backup of your FIM/MIM DBs!!! Exports All The Configuration Of FIM/MIM. This is basically all the options combined. Exports Only The Main Configuration Of FIM/MIM. This should be the option to use when upgrading FIM/MIM. WARNING: This export might take some considerabel amount of time!!! 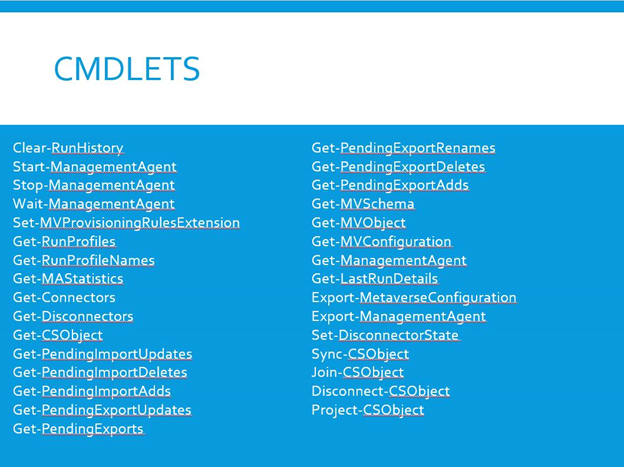 Brain Desmond has updated the FIM PowerShell Modules on Codeplex. Ryan Newington (Twitter and Blog), yet again wrote and created an impressive PowerShell module to manage the FIM/MIM Sync Engine. 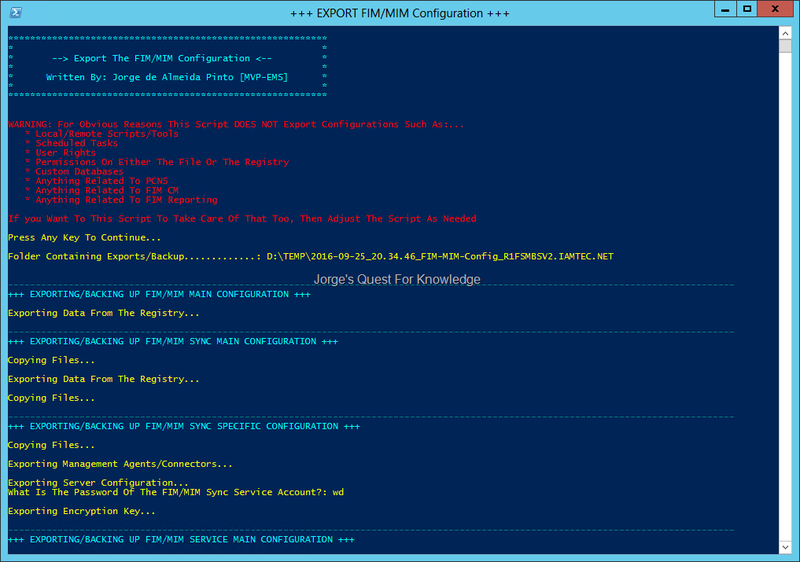 Many stuff to manage the FIM/MIM Sync Engine that was not yet possible through PowerShell, is now possible!!! Description: The Lithnet FIM/MIM Synchronization Service PowerShell Module provides tools that allow interactions with the FIM/MIM Synchronization engine that goes beyond what is exposed via the supported WMI provider. This tool is provided for testing and diagnostic purposes and is intended for use in development and test environments. Any problems that arise from the use of the tool are not supported by the developers or by Microsoft. Libraries that the synchronization client UI uses to interface with the sync engine itself. These libraries are undocumented APIs. The module does NOT interface with the sync engine database in any way. It does not provide any mechanism to alter the internal configuration of the sync engine, unless an executable or documented API is available for that. The developers make no warranties as to the suitability of these tools for use in your environment, nor will we be liable for any financial or other damages arising from the use of these tools. There is a guy called Ryan Newington (Twitter and Blog), and he wrote and created some impressive utilities and tools that you can use in your challenge to design and configure an Identity Management system based upon either FIM 2010 R2 or MIM 2016. Description: The Lithnet Metadirectory Services Utilities package is a .NET library containing extensions and utilities for writing code for the FIM sync engine. The library contains various helper classes and extensions for objects in the Microsoft.MetadirectoryServices namespace, such as the CSEntryChange. It allows you to reduce code and introduces new functions, such as XML serialization of native metadirectory services objects. It can be used in any rules extension or ECMA2.2 project, along side the Microsoft.MetadirectoryServices component. Description: The Lithnet FIM Service REST API is a wrapper for the FIM Service’s SOAP/WCF, exposing create, update, delete and search functionality via a series of standard HTTP calls. The API returns JSON-formatted data, making it compatible with a wide range of platforms and services. Description: The The Lithnet FIM PowerShell module is designed to make working with the FIM Service faster and easier. It abstracts away the complexity of the FIM Service and the FIMAutomation PowerShell module, and exposes a robust set of cmdlets for creating, updating, deleting and searching for resources. Description: Lithnet ACMA is a codeless rules engine for Microsoft Forefront Identity Manager 2010 R2. ACMA provides a means for performing powerful rules-based construction of objects and attributes without the need to write custom code.